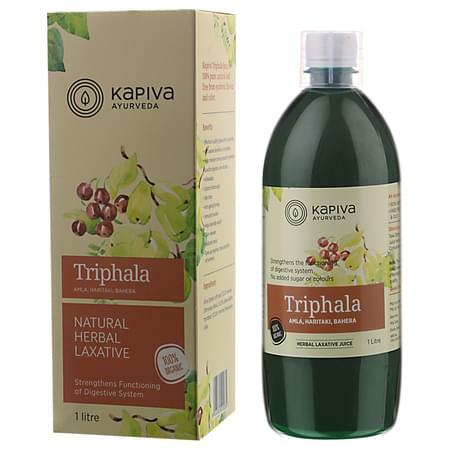 • Kapiva’s Triphala Juice brings you the goodness of triphala, a traditional ayurvedic composition. • Fights the symptoms of acidity, hyperacidity and acid reflux. • Fights constipation and helps in digestion. • Controls blood sugar and helps the body recover from liver disorders. • Boosts immunity, aids metabolism and helps in more efficient absorption of nutrients. • Consume 30ml of the juice with 30ml of water twice a day for a healthy body and mind. • Kapiva derives its name from the three doshas of ayurveda – Kapha-Pitta-Vatta. our range of 200+ GMP Certified products have the right herbs in the right dosage and provide solutions to a variety of ailments. It's the day and age of hybrids, so go ahead and enjoy the best of both worlds - Ayurvedic tradition + Modern-day science and technology.